Michael Ball is from Ottawa and has been a student of the violin since childhood. Michael started out with classical lessons and followed his musical path through many tours and venues and now resides comfortably in several North American styles including Country, Blues, Cajun, Creole, and American Old Time. The classical lessons he had as a kid paid off in ways that he wouldn’t realize until much later. Since then, most of his time has been spent absorbing styles whose first home is in the Southern states, especially Southwest Louisiana. “Though these styles travel the world in the hearts and hands and voices of countless musicians, it’s amazing how many of them are bound together in such a seamless and organic fashion in Louisiana and East Texas,” says Michael. 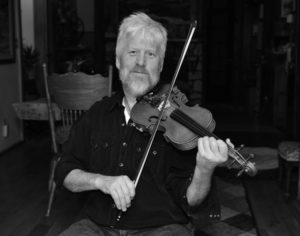 Over the years he has studied with traditional fiddlers from Quebec to Louisiana from Seattle to Texas, and has been influenced by a great many more… many of them play instruments other than the violin. Earlier, while living in Montreal, Michael attended a couple of weekly Jams for many years. This is where he learned about playing “nicely” with other musicians and how, as a violin player, to be useful in a group (“Play melody, if the melody’s taken play harmony, if the harmony’s taken find a rhythm part. Don’t drown out the singer etc”). While on tour in ’92 with Danielle Martineau in Sudbury, he met his charming spouse Jody Benjamin. Since then Michael and Jody have fostered two bands, which are still alive and well, and have recorded six albums together. 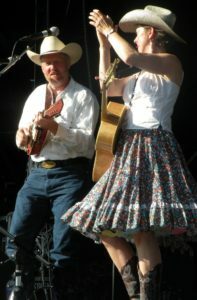 – Rock’n’Roll & Swamp Pop; “The Sweet Potatoes” (www.thesweetpotatostringband.com) – Oldtime; and “The Dusty Drifters” (www.thedustydrifters.com) – Bluegrass. Michael likes performing: “sometimes it’s nerve wracking but it’s always fun.” The bulk of his touring, at festivals and showcases, has been with Danielle Martineau (’92-’96) and Michael Jerome Browne (’04-’07) together with Jody Benjamin as a Trio. As well, Michael and Jody have toured twice across Canada, performing at house concerts.